Regent Seven Seas Cruises has announced thatSeven Seas Splendor will be the name of its second Explorer-class ship, scheduled for delivery in the first quarter of 2020. As part of the naming process, Regent Seven Seas Cruises sought suggestions from travel agents, guests and employees in a sweepstakes held in September. Seven Seas Splendor was chosen from among nearly 2,600 unique names in more than 14,000 submissions. “The extraordinary demand for Seven Seas Explorer has reinforced our decision to expand our fleet and Seven Seas Splendor will offer guests a fifth option that will provide unforgettable experiences in the world’s most compelling destinations, with the incredibly high standards of luxury and service that lure guests back again and again,” said RSSC President & CEO Jason Montague. 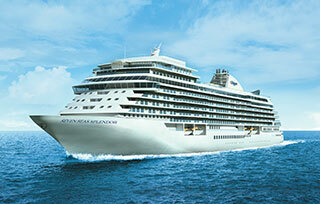 The new all-suite, all-balcony ship will have a gross tonnage of 55,254 and capacity of 750 guests. Celebrating its 25th anniversary in 2017, Regent Seven Seas Cruises boasts a four-ship fleet that visits more than 450 destinations around the world. The line is currently undertaking a $125 million fleetwide refurbishment designed to elevate the level of elegance found throughout the fleet to the standard set by Seven Seas Explorer.